With Summer just beginning to heat up, and record temperatures already being reported throughout Hotlanta and all across Georgia – your air conditioning is something you definitely should NOT take for granted. Thanks to some help from our friends at the Air Conditioning, Heating and Refrigeration Institute (AHRI), Highlight Homes has compiled a list of some basic facts about how your air conditioning works, the best ways to maintain your unit, and valuable energy saving tips that could save you money. A/C units are comprised of three basic components and a chemical in order to cool your home. The chemical in your A/C is known as a refrigerant, and the three mechanical components that convert the refrigerant from a gas to a liquid and back again are the compressor, the condenser and the evaporator coil. All of these pieces of the puzzle work together to transfer heat from inside your home to the outside air. This process begins when the refrigerant arrives at the compressor as a cool, low-pressure gas. It leaves the compressor as a hot, high-pressure gas and enters the condenser. A fan draws air from the outdoors which cools the refrigerant and changes it to a high-pressure liquid before moving it indoors through tubing which converts it to a low-temperature, low-pressure liquid by the time it hits the evaporator coil. The evaporator coil serves to absorbs moisture in the air through the return vents while a powerful fan blows over the coil and the refrigerant – ultimately cooling the home through air supply vents. Once the refrigerant leaves the evaporator coil, it returns to the compressor as a gas and the cycle begins all over again until the desired temperature you have set on your thermostat is reached. Most homes typically have one of two central air conditioning units – a split system or a package system. A split system (described in the cycle above) consists of an outdoor metal cabinet, which houses the condenser and compressor, and an indoor cabinet that contains the evaporator coil. The outdoor cabinet is located next to the home and the evaporator coil is located inside the home, near the furnace – often in an attic, basement or crawlspace. It is important that the outdoor and indoor units are properly matched for efficiency. In a package system, all of the mechanical parts are housed in one cabinet, which is usually located outside the house. We’re fairly sure you’ve heard the phrase “You don’t know what you’ve got ‘til it’s gone.” Air conditioning is something you definitely do not want to go without, especially during the hottest months of the year in Atlanta, July and August. Aside from escaping unbearable temperatures and humidity, these maintenance tips can also help save you some money in the long-run! Get in the habit of checking your air filters regularly. Change them according to the manufacturer’s recommendation or if they are particularly dirty. By changing the filter, you are keeping dust from collecting on the evaporator coil, but clean filters can also cut energy consumption 5 percent to 15 percent. Turn off the power to the furnace before pulling the filter out so the blower doesn’t come on and blow dust throughout the system. Be sure to position the filter according to the manufacturer’s instructions. Take a walk outside to check the outdoor condensing unit, which is typically a large (sometimes noisy) metal box on the side of your house. Clear away debris such as leaves, grass clippings, weeds and plants that could block airflow and reduce its efficiency. You can also clean the outdoor condensing unit by spraying it off with a garden hose. Make sure that all of the vents in the house are unobstructed. Air in your home needs to circulate easily through the vents. If you have floor registers, make sure they are not blocked by furniture. Close off unused rooms and close vents in those rooms so that your A/C unit isn’t having to work overtime to cool the WHOLE house needlessly. Make sure your home is properly sealed and insulated – which can reduce your total energy use by more than 20 percent. Focus first on ducts that run through unconditioned space such as your garage or attic, and seal ducts with mastic or foil-backed tape. After sealing, insulate the ducts by wrapping them in insulation. 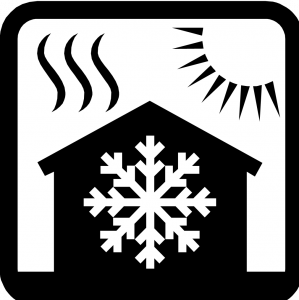 The Department of Energy recommends minimum insulation levels for each part of the home, based on your climate. For more information regarding YOUR recommended insulation level, visit the ENERGYSTAR website at www.energystar.gov. Install a programmable thermostat. According to the Environmental Protection Agency (EPA), a programmable thermostat can save you about $150 a year in energy costs if it is properly used. It is recommended for people who are away from home during set times of the day throughout the week. A word of warning – resist the urge to override the pre-programmed settings. Every time you do, you use more energy and may end up paying more on your energy bill. Set the “hold” button at a constant energy-saving temperature when going away for the weekend or on vacation. Install your thermostat away from heating or cooling registers, appliances, lighting, doorways, skylights, and windows, and areas that receive direct sunlight or drafts as they may give the thermostat “false” readings. Interior walls are typically best. If need be, replace old or failing mechanical equipment. Keep in mind that the average life span of central air conditioning systems is 12- to 15-years (IF it is properly installed and maintained). If your heating or cooling equipment is more than 10 years old, needs expensive repairs, or no longer keeps you comfortable, it may be time to go ahead and replace it. When replacing, look for performance certified equipment, which guarantees you that the manufacturers’ claims of energy efficiency performance are accurate. You can search the free AHRI Directory of Certified Product Performance to find certified HVAC equipment and compare the efficiency ratings of different models. While replacement may seem like an expensive undertaking, now that air conditioning systems are required BY LAW to have a seasonal energy efficiency ratio (SEER) of 13 or higher, you will likely see reduced utility bills. Make sure you are working with a qualified installer who will properly size and install the correct equipment for your home. Check with friends, family and colleagues to find an installer you trust – and you may want to get quotes from several companies. It also vital that the duct work be installed properly. Otherwise, poorly installed duct work can result in less than efficient system performance and higher than expected utility bills. If you do find you need to replace your air conditioning system, Highlight Homes highly recommends that you select an energy efficient model. In doing so, you may be eligible for federal tax credits under The American Recovery and Reinvestment Act of 2009 – but HURRY, these energy efficient tax credits are for equipment placed in service on or before December 31, 2010. For residential central A/C units, an eligible split system must have a stated performance rating of 13 EER (energy efficiency rating – the higher, the better) and 16 SEER (seasonal energy efficiency ratio) for a tax credit of 30% of the total cost of the unit (price of the product itself + installation). An eligible package system must have a stated performance rating of 12 EER and 14 SEER. The maximum credit is $1,500. For more information about air conditioning systems and to find a list of certified products, visit the Air Conditioning, Heating and Refrigeration Institute online at www.ahrinet.org. To learn more about Highlight Homes and their NEW design-build remodeling division, visit www.highlighthomesga.com. When you’re ready to begin the exciting design phase of your really COOL home renovation or to lay the groundwork for the HOTTEST (and most energy efficient) custom-built house on the block, call Highlight Home Restoration and Highlight Homes, LLC at 678-873-9234. Cite: Porter. Cole. “Too Darn Hot” Kiss Me Kate. 1948. Give Your Home the Green Light – Make sure the bulbs you use are all compact fluorescent (CF) light bulbs, that you teach your family to turn lights off when they leave a room, and consider using “daylighting” as your primary source of light during the day by opening blinds or having skylights installed. According to Planet Green, if every American home switched JUST ONE of their incandescent bulbs to a CF bulb, it would save enough energy to light more than 3 million homes for a YEAR! LED lighting is another terrific energy-efficient choice – many with 12 watt power usage and 65 watt light output. As for exterior home lighting, solar power is all the rage and can be found in pathway lighting, spot lighting and more! 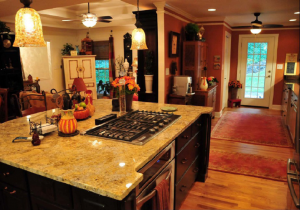 Light Up the Heart of the Home – Uplights on tops of cabinets can accent a high ceiling beautifully, while placing spot lighting under cabinetry can show off the different dimensions in your granite countertops. Adding special “task lights” over areas where you do the most work – cooktop, island, sink – can also help you limit your energy use if you just switch those lights on when you need them. A really great looking lamp set on your countertop can serve as both a decorative accessory AND a task light. 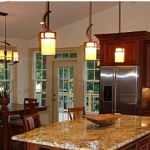 Striking pendant lights over the kitchen island are still trés chic! Set a Mood – Dimmer switches are a great way to choose your light to fit the mood and occasion. Wall sconces along hallways illuminate the way while adding a beautiful design touch and an air of romance. Chandeliers aren’t just for dining rooms and foyers anymore – they can now be found in bedrooms, bathrooms, perfectly posh little girls’ rooms, and more. They add a touch of Hollywood lavishness to take a room from totally drab to totally fab. Electric Eclectic – Don’t be afraid to blend contemporary designs with vintage touches, classic with art deco, or chic with traditional. Have fun with your lighting choices – but use similar colors or metals to tie everything together (e.g. Brushed Nickel or Black). Knock-Knock – What’s the #1 trend in flooring? “WOOD”n’t you like to know! Wood flooring continues to reign supreme in many home makeovers, but there’s a larger focus on being “eco-conscious”. 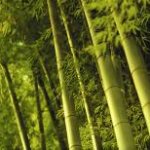 Reclaimed wood or trees that are harvested in a sustainable manner – such as bamboo, cork or Lyptus – are quickly gaining favor for their earth-friendly quality and their natural beauty. Wood flooring complements a wide variety of design styles, has a timelessness due to the fact that it NEVER goes out of style, and can be warmed up with the occasional throw rug for color and effect. Tried and True – For those who prefer the feel of carpet between your toes, shag is still leading the pack. If you want to be earth-friendly, but still enjoy the softness of a high pile carpet – fret not! More and more carpet manufacturers are developing environmentally sound carpets, such as SmartStrand® Carpet which is derived from sustainable corn sugar polymers. SmartStrand® is durable, stain-resistant and comes in a wide variety of colors and styles, including cut and loop patterns. Most homeowners are opting for a tone on tone carpet in neutral colors this year. Tile is Making its Way (BACK) to the Top – It’s not just for bathrooms anymore! Found on the walls, floors and ruins of ancient mosques and Roman temples, 2010 would not be one of the first times tile was in fashion. Well-known for its durability (ceramic tile can last 50+ years in modern homes), tile manufacturers are getting more and more creative with their designs. Made from a wide variety of elements such as porcelain, stone, glass and clay – tile can also come in a broad assortment of patterns, colors and textures. It can be made to look like rock, concrete, leather, reptile skin, marble and more. 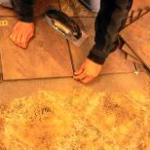 A really good tile contractor can design a one-of-a-kind pattern in your floor with tile inlays, alternating colored tiles and glass mosaic elements. Your floor could well become a work of art. To begin remodeling your home from top to bottom, and everything in between – call the talented team of designers and builders at Highlight Home Restoration at 678-873-9234, e-mail us at info@highlighthomesga.com, or fill out our convenient online contact form. We look forward to hearing from you SOON! No matter what you call it – lavatory, washroom, powder room, toilet, little girl’s/boy’s room, outhouse, potty, privy or the john – the number one trend that’s sweeping the nation in bathroom remodeling is the transformation from a “necessary” room into a luxury retreat, something more worthy of the title “REST”room. More and more people are looking to their bathrooms as a place of relaxation and peace – a place where they can wash away the stresses of the day, calmly gear up for the day ahead or get all dolled up for an evening on the town. As this trend grows, more homeowners are looking to professional designers and remodelers to add special luxury finishes to this often-overlooked room of the house. 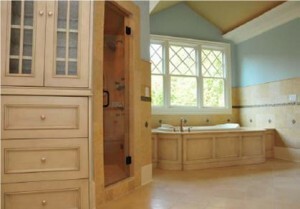 We have compiled a list of the latest must-haves for bathrooms in 2010. We hope they make you “flush” with excitement! 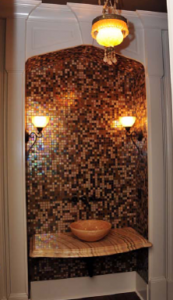 A Touch of GLASS – With the addition of glass tile, mosaics (see photo), more mirrors, and more windows/skylights in the bathroom – these often-cramped spaces are made to seem larger and lighter. Multiple mirrors add to the illusion of greater space, while windows can increase the amount of natural light. Glass tile and mosaics give the impression of luxury – like a bathroom you might find at a 5-star hotel or a fine dining establishment. Glass jars are also a wonderful way to store cotton balls, q-tips, bath salts, etc. The New Media Room – A trend now showing up in bathrooms everywhere is the addition of flat screen TVs, especially where they can be viewed from the tub. Get Soaked – Perhaps the hottest trend to steam up bathrooms in recent years is the replacement of the jetted tub for the large, luxurious soaking tub. Popular since the 1990’s, jetted tubs are designed to give the occupant a relaxing massage, but can be quite noisy – ultimately taking away from what should be a calming experience. A soaking tub has been in vogue since the bathtub’s inception – the only difference is that many of the modern versions come double insulated, keeping your warm bath warm for a nice-long soak. The styles range from contemporary to a throwback to the classic claw-footed tub. Your Own Personal Spa – From converting one’s shower to an actual steam room, to replacing one’s showerhead with dual heads or more powerful massaging jets, to infusing spa-inspired wood elements throughout, many homeowners are taking cues from European spas to transform their bathrooms into a soothing sanctuary. In years gone by, showers often consisted of three tiled walls & a shower curtain. In the last decade or so, many homeowners have begun choosing style over substance. Shower and tub surrounds today are virtually a work of art. 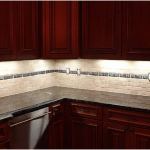 Larger tiles with custom tile inlays surrounded by decorative trim pieces have become the norm. In many showers, the walls consist of tiles that run to the ceiling, and often the ceiling is tiled, as well. It is also not uncommon to have a combination of two showerheads and 4-6 massaging body sprays. Another growing trend is the incorporation of a rain head from the ceiling to immerse the shower’s occupant in a soothing cascade along with mood lighting using new LED colored lights or fiber optic lights to create a tranquil and ever-changing overhead light show. Many homeowners are using clear, frameless shower doors in order to show off the lasting beauty of their masterpiece shower. Soften Around the Edges – By marrying soft lighting from beautiful light fixturing with neutral colors like taupes, beiges, olives, grays and other pale hues, this creates an atmosphere of calm and relaxation and adds to the feeling of a personal spa. Shades of brown are often associated with stability and security, while shades of gray add an air of sophistication. When using neutrals, you can always add a splash of color with your accessories and furniture. Silver Reigns Supreme – The popular oil-rubbed bronze fixturing that has enjoyed a strong foothold in bathrooms for years is seeing a shift toward brushed and satin nickel, as well as polished chrome. Fixtures are also becoming more sophisticated – from beautiful curved lines and antique-inspired creations, to contemporary designs that create the look and feel of a waterfall. Brush Your Teeth In a Thing of Beauty – Sinks are taking precedence in many bathroom remodels – more and more couples are seeking dual vanities and beautiful artistic sinks. With such a wide assortment of sinks to choose from – such as drop in, under mount, pedestal, or vessel – you are sure to find one that fits your unique style & personality. Drawers, Doors and More – While many homeowners still share a fondness for the classic medicine cabinet, more emphasis is now being placed on innovative storage solutions. Lots of small drawers with dividers, deep cabinets to hold extra towels, and vertical storage units are leading the way to less cluttered countertops and a cleaner look in bathrooms. Eco-friendly Loo – As homeowners remodel their bathrooms, they are beginning to incorporate “green” elements such as low-flow toilets, energy efficient lighting, sustainable building products, and on-demand water heaters. At Highlight Homes and Highlight Home Restoration, we understand the importance of creating rooms of solace and retreat, places where you can escape the day’s stresses and worries, spaces where you can relax and recharge. 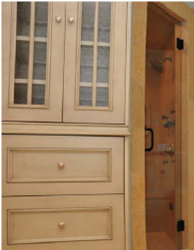 Bathrooms are only one of our many specialties. We look forward to the opportunity to sit down with you to discuss the transformation of your bathroom into what may well become one of your favorite rooms of the house. Not only can we design the ideal retreat, we can build it for you! To get started on the exciting design phase of your exciting bathroom remodel, we invite you to call Highlight Home Restoration’s experienced designers at 678.873.9234, call us at info@highlighthomesga.com, or fill out our online contact form TODAY! According to reports late last year from Pantone, the global authority on color and provider of professional color standards for the design industries, THE hottest color for 2010 is turquoise. Believed by many cultures to be a talisman color – inspired by the sea and sky, it’s a shade associated with deep compassion, healing, faith and truth. Not only is it a soothing color to add to one to all four walls of a room, it’s a terrific shade to add as a SPLASH of color through throw pillows, lamps and other décor accessories. Pantone leads the way for builders, painters, interior designers, and fashion designers all over the world. And – while most paint companies have taken cues from Pantone regarding color trends for 45 years, some are setting a few trends of their own. Benjamin Moore’s hottest color for 2010 is Cedar Green (2034-40)– a “vibe filled green that offers flexibility in design. “ It’s a cool color that blends well with navy blues, buttery yellows and cottony whites. Not only is Green all the rage in relation to environmental concerns – it is also from a color family that promotes relaxation and balance because it is in the middle of the visible spectrum of light. For more information about Benjamin Moore Paints and their latest color palettes, visit them online atwww.benjaminmoore.com. Check out their new Personal Color Viewer, where you can upload pictures of your home’s interior and exterior – and use a virtual paint brush to try out colors from Benjamin Moore’s collections before you ever lay down a dropcloth. Sherwin Williams developed their 2010 Color Forecast by looking to “hues of the past to paint their way into the future” with their inspired Rooted, Treasured, Simplified and Refreshed Collections – many with cool shades of blue and green, bold reds, corals and golds, and tried-n-true neutrals. To view Sherwin Williams newest color collections online, visitwww.sherwinwilliams.com. They also feature an online color visualizer, as well as earth-friendly paints with their “Greensure” designation – offering maximum performance, long-term durability and the highest indoor air quality ratings. Duron Paints & Wallcoverings – the “Pros Choice” since 1949 – also looks to the past (the Old South, to be exact) for the latest color trends with its Historic Collection Palettes, including The Carolina Lowcountry Collection and Colors of Historic Charleston. Blues and greens again play a vital role in these palettes, with a supporting cast of warm corals and shades of neutral. For more information and to view the company’s latest color palettes, visit www.duron.com. Behr suggests you use color to create an ambience and set a mood in any room. Cool colors can impart a calm, serene effect while warm colors can invigorate and energize. Soft shades of green and blue are perfect for a room intended for peace and relaxation – such as bedrooms and bathrooms, while bold shades of yellow or orange can be uplifting and lively – perfect for kitchens or family rooms. Neutrals, such as a harmonious and peaceful taupe, can add a sense of sophistication and style to any home. For more information or to visualize your colors virtually with ColorSmart, visitwww.behr.com. Modifying your paint color is perhaps one of the easiest and least expensive ways to change up the look of the interior and exterior of your home. When undergoing a home renovation, it’s an element that should receive much attention – as color can often help to pull all of the pieces of the puzzle together beautifully. Highlight Home Restoration designates Sherwin William’s Copper Wire (7707) as OUR number one pick for color this year. It’s reminiscent of last year’s warm terracotta orange called Clay Pot, which we used with great success in a kitchen remodel. Orange is a color that adds life and vibrancy to a room, lifts the spirits of the all who enter and blends well with natural elements like household plants, hardwood floors, granite countertops, and wood cabinetry. To begin selecting your color palette and get started on your Atlanta home renovation for 2010, call Highlight Home Restoration’s talented team of experts at 678.873.9234, e-mail us atinfo@highlighthomesga.com, or fill out our online contact form.